You can start from $89/week (our management fee) plus the cost of your Google Ads. For a small campaign, spent no more than $250/week total (ad spend and management fee). Your ads target ‘warm leads’ right when they want a chiropractor. Advertise within your patient-catchment and key suburbs. We use conversion-proven keywords so you reach the right people at the right time. Control your spend with daily caps. Yours ads will show for certain keywords and AI uses responsive ads to show the best version at the right time. Start with a small campaign and scale up over time as your ROI grows. 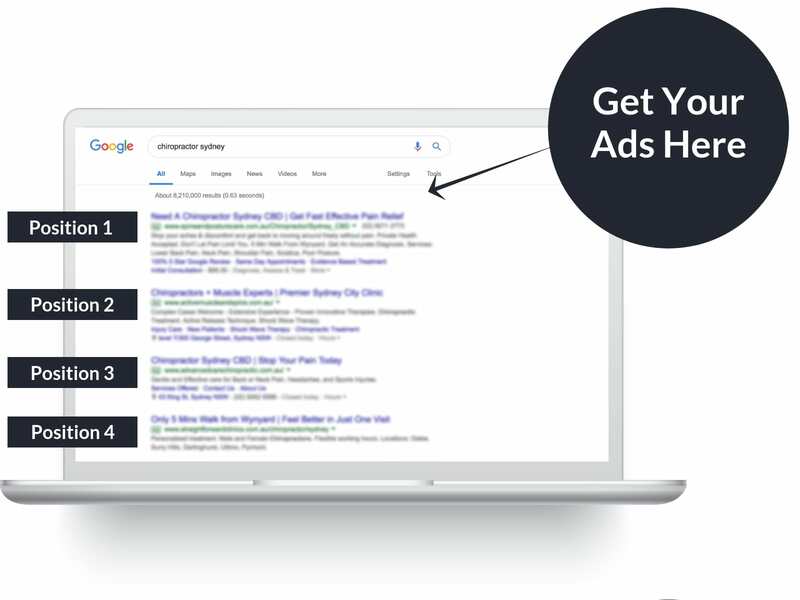 Google AdWords, or online pay-per-click advertising, connects paying customers with your chiropractic clinic. Your Google ads are only shown when target keywords are entered into search engines. E.g. “Chiropractor + My Suburb”. We’ll make sure your ads are seen by potential patients at the exact time they’re searching for a chiropractor. With our years of research, we know the keywords that get results. We don’t want you to waste money. We start your campaign small and after we demonstrate a positive ROI, only then can you scale. We’ll provide you with a measured and accountable campaign plus regular reporting, showing you the calls and search terms patients use. Within the first three weeks of our new account setup going live, the ads produced x14 new phone enquiries for a total ad cost of $306. This gives a cost per enquiry figure of $22. Read more. Overall, in under two years we produced 717 new patient leads for The Back Clinic with the average cost/lead ranging between $20 and $40 per lead (it all depends on the keywords you target). Read more. This record month (November 2017) generated the lowest cost-per-lead with a figure of $14 per enquiry. x12 enquiries received for a monthly spend of $170. Read more. Google AdWords campaigns have been show to return $2 for each $1 invested (Google Economic Impact Report). The ongoing optimisation of a campaign is the key to improving ROI. How much is an average patient worth to your clinic over the course of a year? $500, $1K, $5k? We have generated clicks for as low as $1. If a patient signs up with you and follows through with your recommendations for care, there is significant upside for you to benefit from. It’s only after we establish a positive ROI scenario and demonstrate to you the financial success of the campaign, that you may increase your daily budget, further maximising your AdWords ROI. Note: As with any marketing campaign, there are no guarantees. We will setup and fully optimise your Google Ads account however past performance is no guarantee of future results. Having said that, if you haven’t tried Google Ads before or if you’ve been running the campaign in-house, this is something you really have to try. 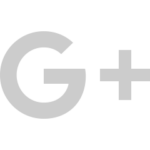 Service: Attract new patients with Google Ads pay-per-click advertising. 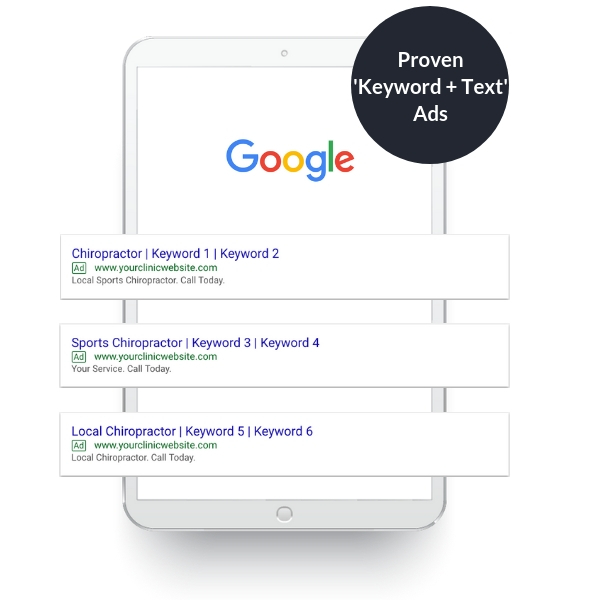 We will run your chiropractic Google Ads with our proven keyword + text combinations, saving you time and money. Investment: From $89/week plus ad spend. Results: Our lower cost campaigns are better able to generate a positive ROI for your clinic. You usually get clicks and enquiries from campaign commencement (ads go live week two) however the campaign improves over several months. Note: We purposefully start your campaign small and only after a positive return on investment scenario may you increase your ad budget. To find out more, please leave your details in the contact form below.